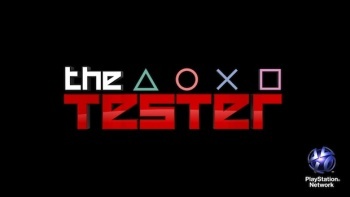 The cast of the PlayStation Network's reality TV experiment, The Tester, is a diverse crowd of folks all vying to become one of the most sought after positions in the industry, a QA goon. In September, Sony held an open call for people to submit a video explaining why they want to be an official Sony videogame tester. The submissions were whittled down to 11 cast members, who are now poised to undergo 8 episodes of physical and mental tests to see if they have what it takes to fulfill the basic job requirements of the entry-level position. The Tester will be shown on the PlayStation Network, but there are no details on whether you will be able to watch the video for free, whether it will require a subscription or if you will have to purchase individual episodes. Unlike hit reality series such as MTV's The Jersey Shore or those Real Housewives shows, the cast members of The Tester are an extremely diverse group, with every body type and ethnic background represented. Sony did copy the recent trend of giving each cast member a catchy nickname like "Barmy" or "Big D" or "Please God, Don't Make Me Watch This Show." "Star" is a professional gamer from Michigan who realizes that she can't make a living like that forever and is competing in The Tester for the long-term job stability. Favorite quote from her audition video: "I have 9 tattoos. I have a chest tattoo which is pretty cool... This black gamer tee shirt is toned down for you guys, I'm usually wearing fishnet stockings." Danny Nguyen is a 26 year old used car salesman from Columbia, MD, who doesn't have many friends but still manages to keep it goofy. "I don't like to take advantage of people but if something needs to get done, it gets done. If I need to put food on the table, I need to sell." "Cyrus" is a bartender from Raleigh, NC who sounds like everyone's favorite frat boy. "I've broken a couple of controllers," he said with a laugh. "Not necessarily from anger at the other players, more from players on my own team because I knew they should have done something." Darrell Shelton is P.A. with TV from New Jersey, who describes himself as a nice guy but said, "I can be stubborn and, especially in a competitive setting, I can get a little ignorant." There are 11 cast members in all, and they are coming soon to a PlayStation 3 near you. It's up to you if you really want to pay attention. Sony's website for The Tester is here.